Financial scams are a common but potentially devastating problem. In 2016, scammers stole $16 billion from U.S. consumers, and there’s a new victim of identity theft every two seconds. Today, fraudsters have a growing number of tools at their fingerprints to help them pull off scams. More personal data exists in digital databases, and people put more information about themselves online. Luckily, people can also do a lot to protect themselves. Here are five tips to keep in mind. Before giving financial information to any company, charity, seller or organization, take some extra time to make sure they’re legitimate. Do a quick search for reviews of the company. Double-check their website name or phone number. Check with the Better Business Bureau (BBB) and your state or local consumer protection agency about whether the organization is credible. Taking an extra moment to double-check now can save you a lot of trouble later. If someone tries to rush you into making a purchase decision, don’t listen to them. Creating a sense of urgency is a common scamming tactic. If you get an unexpected request for personal or financial information, don’t answer right away — there’s a good chance the request is a scam. Your bank or credit card company will not contact you and ask for your personal information. If you know the company that is requesting the info and the request seems legitimate, reach out to the organization via a contact method you know is genuine. Ask them if they contacted you to ask for the information. Credit cards are a relatively safe way to make purchases online because they have fraud protection built into them. You can, for example, dispute charges. Some other payments methods, such as wire transfer and prepaid cards, come with no such protections. Once you send money using one of these methods, it’s nearly impossible to get it back. If a company requires you to pay using a wire transfer, preloaded card or similar method, it’s likely a scam. Never open hyperlinks in unexpected emails, especially if the sender wants you to enter financial or personal information on the page the link goes to. 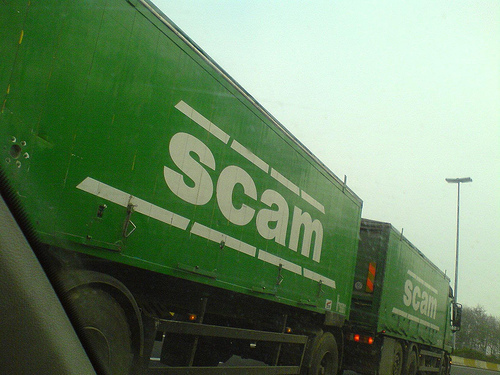 Fraudsters may send emails that look like they’re from legitimate companies but are scams. Some common giveaways are sender names and link URLs that have nothing to do with the company supposedly sending the email. For example, the email may look like it’s from Amazon, but the sender name and URL are a random string of letters and numbers. Sometimes, scammers can modify URLs to look like something they’re not, so always verify with the company via another means before clicking the link. Just like scammers can change the appearance of URLs or make their emails look legitimate, they can also make their phone calls appear real. Scammers can fairly easily fake caller ID information, so it seems like it’s from an authorized caller. If someone calls you and asks for financial information, it may be a scam. If you think the call may be real, call back using a number you know is for the company. Financial scams are seemingly everywhere, but there’s a lot you can do to protect yourself from these risks. Always think twice before sharing personal or financial information, and only share it with trusted organizations using trusted methods when it’s necessary. PSECU, a credit union from Pennsylvania, created this helpful infographic covering some of the most popular online financial scams — check it out! This is quite an informative post. We should never click on unknown links that we get in our emails. They may be hacking sites or fraudulent site ready to ripe us.